personalties pretty much helped me make the entire wall. Although suzu's been a bit naughty lately huh? used a star brush for lulu's side and blending with colors. Textures used a bit and playing more with the colors. them because their damn hair drove me crazy. and suzu with his curly top make an excellent team of torture. Nice background, the devil/angel contrast is an interesting idea. XD XD Solar Suzaku, explains the tan. It's really nice <3 I love Lulu's expression, devilish. Great job on the wallpaper. The clouds look so fluffy. But compare to the stars, they don't really flow, that well. It's sharp on one side and kind of blurred on the other. The 'style' is different. Or was that what you were going for? Overall, nice wallpaper :) Keep it up! Great vector and you placed them really well. I think another reason why Lulu fits the moon is because he looks like some cliched vampire with that cape of his (lol). This is such a beautiful wallpaper, Kitten! The vector is like.... perfect it's crazy! You are truely a master of the vector art. This wallie is a reason as ever for me to start watching Code Geass (lolwut, hasn't seen it?). Love the vector! Great job! I've thought of doing a moon and sun wall too, but I don't think I could pull it off well ^_^' Maybe someday. I really like it .^^. yeah i can totally with this picture. 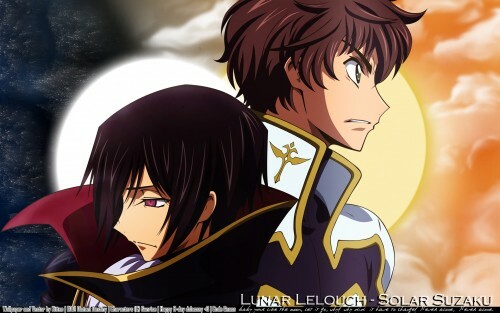 Lelouch is like the night, spreads evil through the land. Suzaku is like the day, gives hope to everyone around him. I LOVE THE EFFECT OF THE MOON AND THE SUN! Somehow the scenery fits both of them perfectly. Love it!the good and bad side! suzaku and lulu!